More and more we are hearing of new books and tales about the location of the Ark of the Covenant, some based on theories and some based on actual claims of sightings. Ron Wyatt also claims that he found the Ark in 1982 – but how do you know who to believe? Until you can see solid evidence for yourself, you cannot know for sure who is telling the true story. In Feb. 1988, when Ron first publicly told about his discovery, he concluded his talk with the request that people “just watch, and wait.” The time is getting closer when you will no longer have to simply wonder, or believe anyone just because you think they may be an honest person. The most awful and solemn events of man’s history are soon to take place- events which men have also been theorizing about, but which will certainly be beyond anyone’s wildest imaginings or theories. 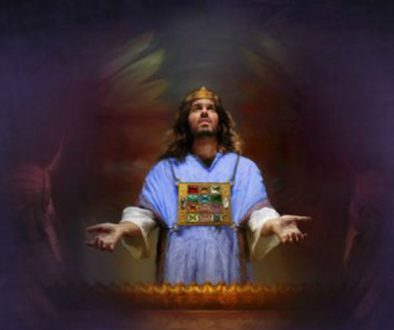 Events have already begun to occur which have led us to believe that we are quite near the time when the Ark of the Covenant will be made known to the world. How near we are, I do not know, but we have reason to believe we are quite near. Therefore, we have decided that now is the proper time to present the details of Ron’s excavation which resulted in his discovery of the Ark. In 1978, Ron and his sons, Danny and Ronny, made two trips to Israel in order to drive to the western shore of the Gulf of Aqaba to go scuba diving in search of chariot parts in the Red Sea. 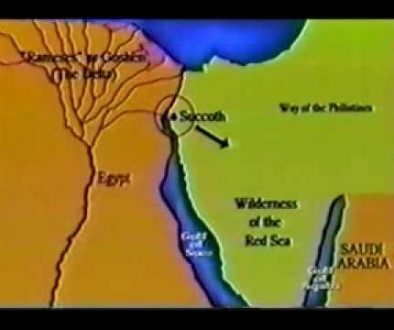 This was during the time that Israel was occupying the Sinai Peninsula and therefore the place Ron believed to be the crossing site could only be reached by traveling from Israel instead of Egypt. During his second dive trip, he learned a very painful lesson. He swam for hours, searching the sea floor, at a depth of about thirty feet, believing that the water would filter out the suns harmful rays. However, this wasn’t the case and as a result, his legs and feet became painfully swollen to such an extent that he couldn’t get his fins on. Unable to dive, and with no motel in the area, he and the boys had no choice but to return to Jerusalem to wait until their flight from Tel Aviv left for the US. But Ron didn’t know what to think – he knew it was a “supernatural” experience, but was it of God, or was it of “someone else”? By this time, Ron had made major discoveries in Turkey, and had found numerous chariot parts in the Red Sea. But not once had he ever had an experience such as this. It was like a thunderbolt out of the blue on a perfectly sunny day. He had to decline the man’s offer, at least until he could figure out if there was any reason to believe the Ark could be in that location. So, he and the boys came on home as planned. But once at home, Ron began some serious research and study. Why Would the Ark Be in That Location? 2CH 35:1 Moreover Josiah kept a passover unto the LORD in Jerusalem: and they killed the passover on the fourteenth day of the first month…. 3 And said unto the Levites that taught all Israel, which were holy unto the LORD, PUT THE HOLY ARK IN THE HOUSE WHICH SOLOMON THE SON OF DAVID KING OF ISRAEL DID BUILD; it shall not be a burden upon your shoulders: serve now the LORD your God, and his people Israel,… 19 In the EIGHTEENTH YEAR OF THE REIGN OF JOSIAH was this passover kept. This was about the year 621 BC, just 35 years before the destruction of Jerusalem and the temple by Nebuchadnezzar, when Judah went into the second phase of their Babylonian captivity. What did this tell Ron? It told him that the Ark disappeared from the Divine record sometime between 621 BC and 586 BC. Since the temple was completely destroyed, there is no doubt that it was NOT there after that time. As Ron continued to study, he noticed something he found strange- in 2 Kings 24:13, 2Kings 25:13-18, and Jeremiah 52:17-23, a very detailed account was given of the items taken to Babylon from the “king’s house” and the “house of the Lord”- it even mentioned small items like “spoons”, etc. But the Ark isn’t mentioned. Neither is it mentioned in the lists of things brought back from Babylon in Ezra 1:7-1:11. Since we are told in Jeremiah 27:21,22 that everything taken to Babylon from the “house of the Lord” would be returned, and since the Ark wasn’t among the returned items, this proves that it was never taken there. Shishak and Sennacherib also took items from the “house of the Lord”- which didn’t include the Ark. So what happened to it? In 2 Kings 25:1, telling about the siege of Jerusalem by Babylon, we are told that they (the Babylonian army) “pitched against it” and built “forts against it round about”- which means they built a “siege wall”. This verse further tells that the siege lasted over a year before the city was taken. And it was with this verse that Ron found the evidence which indicated to him that the Ark could be in the location he had pointed to. Of course, it wasn’t positive proof – to Ron it only meant that it was a possibility. What did this “siege wall” have to do with the Ark? Siege walls were built by attacking armies outside of the walls of the city under attack, at a distance outside of the range of the weapons used by that city – what were these weapons during this time? 2CH 26:14 And Uzziah prepared for them throughout all the host shields, and spears, and helmets, and habergeons, and bows, and slings to cast stones. 15 And he made in Jerusalem ENGINES, INVENTED BY CUNNING MEN, to be on the towers and upon the bulwarks, TO SHOOT ARROWS AND GREAT STONES withal. 4) it was hidden somewhere within the confines of the city wall of Jerusalem and the Babylonian siege wall. The entire city AND the temple were destroyed in 586 BC by the Babylonians, so the Ark could have only escaped destruction or captivity by NOT being anywhere in the city. Again, the site he had pointed to was, he believed, outside of the ancient city wall and within the siege wall. It was supposition based on study, but still only supposition. Yet, it was enough to base a decision on- he decided to go ahead with the excavation. 2:2 The records show that it was Jeremiah who… 4,… prompted by a divine message, the prophet gave orders that the Tent of Meeting and the Ark should go with him. Then he went to the mountain from the top of which Moses saw God’s promised land. 5 When he reached the mountain, Jeremiah found a cave-dwelling; he carried the tent, the Ark, and the incense altar into it, then blocked up the entrance. 6 Some of his companions came to mark out the way, but were unable to find it. 7 When Jeremiah learned of this he reprimanded them. `The place shall remain unknown’, he said, `until God finally gathers His people together and shows mercy to them. 8 Then the Lord will bring these things to light again, and the glory of the Lord will appear with the cloud, as it was seen both in the time of Moses, and when Solomon prayed that the shrine might be worthily consecrated. Also worthy of note: the quote in 2 Maccabees, above, could have been mis-translated over the years and originally have stated that the Ark was hidden NOT in the mountain Moses was ON when he viewed the promised land (Mt. Nebo, Deu. 32:49), but instead it could mean that the Ark was hidden IN the mountain that Moses SAW when he viewed the promised land. From Nebo he would have been able to see Jerusalem because of its altitude. JER 3:16 And it shall come to pass, when ye be multiplied and increased in the land, in those days, saith the LORD, they shall say no more, The ark of the covenant of the LORD: neither shall it come to mind: neither shall they remember it; neither shall they visit it; neither shall that be done any more. JER 3:18 IN THOSE DAYS the house of Judah shall walk with the house of Israel, and THEY SHALL COME TOGETHER OUT OF THE LAND OF THE NORTH to the land that I have given for an inheritance unto your fathers. The “land of the north” was Babylon where they would soon spend 70 years in captivity. If this understanding is correct, it indicates that Jeremiah DID have knowledge that they would no longer have the Ark when they returned from Babylon. But also important to note is that he CLEARLY indicated that “neither shall that be done ANYMORE”, which is proof that there is no promise of it ever being reinstated. In fact, in Ezekiel, when he gives the instructions for the temple, he gives NO instructions which included the Ark. It was never mentioned. Since Jerusalem was surrounded by the Babylonian siege wall during the time the Ark seemed to have disappeared, Ron believed it may have been possible for someone to have taken it to a location within the siege wall and not be detected. The quotes we read above agree with the “time”, but we just don’t know for sure – and again, these books are not inspired so we cannot rely on them. GEN 22:2 And he said, Take now thy son, thine only son Isaac, whom thou lovest, and get thee into the land of Moriah; and offer him there for a burnt offering upon one of the mountains which I will tell thee of. 2CH 3:1 Then Solomon began to build the house of the LORD at Jerusalem in mount Moriah, where the Lord appeared unto David his father, in the place that David had prepared in the threshing floor of Ornan the Jebusite. The quarry which contains the site Ron was to excavate is part of the northern extension of Mt. Moriah. On the east, south and west sides of Jerusalem are very deep valleys which protect the city from foreign invaders. But on this north side, they were vulnerable. Therefore, a “dry moat” or trench was quarried out of “Mt. Moriah” on the north side to prevent an enemy from being able to simply reach and break through the wall along this ridge. Then, at some unknown point in time, the northern portion of “Moriah”, now separated from the city, was used as a stone quarry. Starting on the south end of this now separated part of “Moriah”, on the western side, stone was cut out of the mountain, lowering the ground level to that of the trench which extends just outside of the north wall. The site Ron pointed to was along the quarried face (escarpment) of “Mt. Moriah”. This cliff-face is referred to by some as “the Calvary escarpment” because it contains the “skull-face” that many believe was “Golgotha” or “Calvary” where Christ was crucified. It also contains the site traditionally called “Jeremiah’s Grotto”, the “Garden Tomb” (where many believe Christ was buried) and St. Etienne which contains a large complex of Jewish tombs dating to the first and second temple periods cut into the side of the mountain. The escarpment is many hundreds of feet long. And it was Ron’s belief that this WAS the general area of the crucifixion, and the Garden Tomb, he also believed, was indeed that of Joseph of Arimathaea which had once held the body of Christ. But these things were not related to this project. He was now searching for the Ark of the Covenant. It was January, 1979 when Ron and the boys returned. Snow was on the ground. He now had to decide how and where to begin. The site he had pointed to was being used as a trash dump and appeared to hold very little promise to the human eye. It was located along this escarpment where the ground met the cliff-face. He had investigated the area adjacent to the escarpment and realized that the ground was raised to a much higher level today, which meant that the rock floor was many, many feet below the present ground level. In the past, Jerusalem has been destroyed many, many times. And the customary method of rebuilding these ancient cities was to simply build on top of the destruction level. Today, the debris is removed before rebuilding, but not so back then. This is why archaeologists are able to find evidences of many cities which have existed on the same site – they simply excavate through each successive level down to the next until they reach bedrock – which indicates that they have reached the first city to be established on that particular site. The site Ron was to excavate had a ground level many feet higher than the quarry floor to the south before the city wall. So, he and the boys could do nothing but begin to dig straight down. The original location that he had pointed to in 1978 contained an extremely large boulder just barely exposed above the surface, and Ron decided to begin digging several yards to the right. It was to be a job of mammoth proportions – these three, Ron, Danny and Ronny, would eventually remove many tons of rock and debris, having to sift through all of it for any artifacts. This was a requirement of the Department of Antiquities which they would always comply with. So, they dug straight down along the cliff face, forming a steep wall with the earth they removed. Almost immediately, Ron noticed a “shelf-like” niche cut into the face of the cliff. Digging down further, he discovered there were three of these “niches” cut into the face of the cliff with a smaller one on the right side. He was convinced that these were cut into the cliff-face to hold “signs” or notices. And because of the location- in the vicinity of the “skull-face”, and because there were three of these, he believed they were where the notices stating the crime of the crucifixion victim in three languages were placed. Roman crucifixions consisted of three basic elements, all perfectly described in the account of the crucifixion of Christ – first, the scourging; then the carrying of the crossbeam by the condemned to the site; and finally the nailing or binding of the condemned to the cross-beam and then attaching this beam onto the upright post and setting it up.. But another element was also involved. In order to be a deterrent, the CRIME of the victim had to be posted in clear sight of the passers-by. For this purpose, they used a titilus, which was a board covered with gypsum, inscribed with black letters. This was usually carried ahead of the victim on the way to the crucifixion, and then posted above the cross in clear sight. The common conception about Christ’s crucifixion was that a single sign written by Pilate was nailed to His cross above His head. This may very well have been, However, in order for the passers-by to be able to read these signs, written in three different languages, they would have had to have been quite large, much larger than a hand-written notice on a paper. Just recently we learned a great deal about the visibility of signs at our new museum. We put up signs that looked very large to us (six- and eight-inch letters) but when we placed them on our building and walked across the street, or even to the end of the parking lot, we discovered that they were very difficult to read. A sign written by Pilate on a piece of paper, nailed to a cross, would have been almost impossible to read even by those standing directly in front of the cross. Add to this the fact that in Jerusalem, three different languages were common (Hebrew, Greek and Latin) and it becomes apparent that the signs above Christ’s head were much larger than we have commonly believed. “Over” certainly could NOT be translated to read “on” in this above verse! This same word, “epi,” is also translated in other places to read “above.” Therefore, the Scriptures do not specifically state that the “title” was nailed onto the physical cross. All it states for sure is that the “title(s)” were placed “over,” “above,” “about,” etc., the cross. So with this understanding, and the information on Roman crucifixions and the titilus covered in gypsum and written in black ink that the Romans were known to use, he felt his conclusion was at least not to be ruled out. Little did he suspect how it would later be so incredibly confirmed. When he first found the niches, he placed boards in them for demonstration purposes. Digging deeper, and showing that there were no more niches below these, he had signs painted in the three languages which they set up and photographed. He believed the much smaller niche was for the ever-present Roman eagle. But again, this wasn’t the purpose of this excavation so they continued to dig. As they continued to dig straight down, the cliff face was on one side, forming a solid wall. But on the other side, the earth wall began to exhibit signs of instability and Ron feared that it would soon collapse, perhaps burying them in the hole. He decided that they should move back along the cliff-face to the original site that he had pointed to. He dreaded it because of the huge boulder he had found just under the surface – but he felt he had no choice. Ron had felt justified in beginning the excavation several yards from the original site, because it was in the same general area. And with the discovery of the niches, he was satisfied that it hadn’t been a completely wasted effort – but still he had another purpose for this excavation. As they began to dig around the huge boulder extending out from the original site, he discovered that there was enough room behind it (between it and the cliff-face) to begin their dig. As they began to dig downward, they very soon came upon another item of interest. Carved out of the cliff-face was a hole which extended through a section of protruding rock allowing a rope or similar object to be threaded through it. The great care obviously devoted to chiseling out this object indicated that it had an important use, but they would learn that later. They reached bedrock 38 feet below the present ground surface. Carefully removing debris, they found themselves in an approximately 15 foot diameter round chamber carved out of the rock with steps chiseled into the shaft descending from the top in a spiral to the bottom. At some point in time it had been modified and plastered, reused as a cistern. Either of these explanations would explain the presence of the “rope hole” chiseled in the cliff-face — it was for the rope that held the bucket or jug which was lowered down into the shaft to retrieve grain or water. Ron chiseled through the plaster and found a large amount of pottery among the dirt and debris used as fill to form the cistern. When he turned these pottery pieces in to Antiquities and they examined them, they informed Ron that some of them date back to the Jebusite time (before David took the city). The latest dated specimens were from the Roman period, which tells us that the grain bin was plastered during Roman times. As exciting as these discoveries were, again they weren’t what Ron was looking for. Ron thought this rock was much too symmetrical to be a natural-shaped rock, so he decided to pick it up and examine it more closely. When he lifted it, he discovered that it was covering a squarish hole chiseled into the bedrock. There were no more holes in the platform-like shelf, so he began digging into the packed earth in front of and level with the “platform”. It was about four feet before he came to the lower level of bedrock, and here he uncovered three more squarish holes chiseled in the rock in front of this “platform.” His measurements showed that the elevated “platform” with the squarish hole and crack were located fourteen feet directly below the three cut-out niches in the face of the cliff, now above ground level. 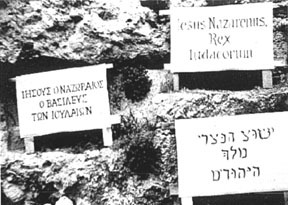 His earlier conclusion that the cut-out niches were for the signs stating the crucifixion victim’s crime in the three languages of Jerusalem was now supported by the fact that he had found more square holes, all about twelve to thirteen inches square, cut into the bedrock — holes he firmly believed once held crosses. The one elevated above the rest (on the shelf-like platform of bedrock), he believed, held Christ’s! The building structure that remained intact showed that a building covered the entire site. He concluded, based on the evidence they’d found, that a Christian church had been built over the place of the crucifixion of Christ – the stone wall extended along the cliff-face directly behind the cross-hole that was on the “platform-like” shelf of bedrock. It appeared that this was the place where the “featured” criminal-victim was crucified, being elevated several feet above those crucified around him. The “altar stone” was set in the stone wall, extending out horizontally almost directly above the elevated cross-hole with the crack. 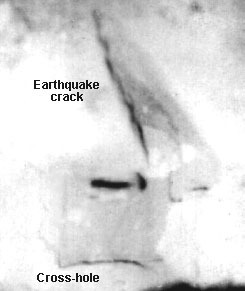 The “Crack” in the Cross-HoleThe crack extending out from the cross-hole on the elevated “platform” appeared to Ron to have been caused by an earthquake – it displayed no evidence of being chiseled. As he removed debris from the cross-hole, he finally reached the bottom and measured it – it extended 23.5 inches into the solid bedrock, while the crack appeared to extend much deeper. But at this time, he didn’t attempt to clear it out nor did he measure it. It would be over a year later before he would learn that the crack extended about twenty feet into the bedrock. “Dating” the Remains of the BuildingHe found coins during the course of the excavation which helped to narrow the date of the building. He found a Roman coin with Emperor Tiberius who was Emperor from 14 to 37 AD, which was the earliest dated coin they found. The latest coins were from about 135 AD, but no later. This is consistent with the known history of Jerusalem and placed the date of the building between the time of the crucifixion and 135 AD. But further information indicates that it was most likely built after 70 AD. Prior to 70 AD, (when the city and the temple were completely destroyed by the Roman general, Titus), Jerusalem was still under Roman rule and the crucifixion grounds would have remained in use. Josephus tells how Titus, during his siege of Jerusalem, had as many as 500 people a day crucified (Wars of the Jews, Book V, Chapter XI, para. 1). After 70 AD- No More Mass CrucifixionsBut after the destruction in 70 AD, with most of the Jewish inhabitants having been killed or sold as slaves, the city was reduced to a Roman camp. Vespasian offered the landed property of Jerusalem for sale to foreigners, although we have no records of who purchased any land there. The garrison of eight hundred Romans in the camp was stationed there to insure that the city was not rebuilt. The hatred of the Romans was for the Jews. Therefore, during the time after 70 AD, when Jerusalem was only a Roman camp with the occasional foreigner (non-Jew) living in the area, the use of crucifixion would be virtually eliminated. The Christians were apparently tolerated by the Romans, as is supported by the fact that in 130 AD, when the Emperor Hadrian came to Jerusalem to rebuild it as a Roman city named Aelia Capitolina, he showed favor to the Christians while forbidding any Jew to ever set foot in the city again. This and other things contributed to a revolt among the Jews in Judea in 132 AD which finally resulted in the death of at least half a million Jewish men, and from this time on, Judea was no longer called by that name, but referred to by the old name of Palestine. The new Roman city of Aelia Capitolina remained a city, but did not prosper. The fact that the coins Ron found in the ancient building cease at about 135 AD indicates that whoever built and used this ancient structure apparently abandoned it at that time and left the region. The fact that the foundations are still intact indicates that it didn’t suffer destruction at the hands of an invader, but most likely fell into disuse and decay. Eventually, over time, it was covered in dirt and debris. Whatever was the case, the evidence shows that the structures were not disturbed since the Roman time. “A VERY GREAT Stone”As they continued to clear the area outward from the cliff-face, the layout of the building was found to be very simple. One wall ran parallel to the cliff-face, along the top of the elevated “platform” section of bedrock. Two exterior walls extended out at 90 degree angles from each end of this first wall. They began to dig, searching for the last wall when they came to another hand-hewn rock. It was a little less than two feet thick, and the portion that was extending out of the dirt and debris looked as if it were curved, somewhat like a large, thick rounded table-top. Clearing more from around it, Ron saw that it was of immense size and they decided not to continue digging. He theorized that perhaps this was the seal-stone from the tomb of Joseph of Arimathaea in which Christ was buried. If he was correct in his conjecture that this was an early Christian church building, perhaps they had incorporated this seal-stone into the actual building. It certainly appeared to be larger than any seal stone he had ever seen or read about. The largest that had ever been found, to his knowledge, was 5.5 feet in diameter. THIS stone would far exceed that. However, it would be several years later before he would learn its true dimension — a little over thirteen feet in diameter – when he used sub-surface interface radar from above the ground. “In the Garden a New Sepulchre”In the same escarpment is the Garden Tomb which was discovered in 1867 when the landowner was digging a cistern on his property. As with the sites Ron was excavating, this tomb was beneath the ground level, buried in the debris of many, many years. When the owner discovered the tomb, he abandoned his plans for a cistern. 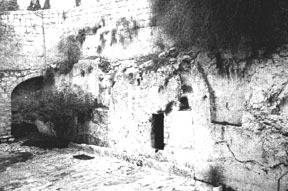 When General Gordon of Britain visited the area and became convinced that the “skull face” in the relatively near section of the escarpment was the true location of Golgotha, this tomb became the prime suspect for being the tomb of Christ. It met with strenuous opposition from the traditionalists who were adamant that the Holy Sepulchre inside the city was the true site — but it soon gained some adherents. When completely excavated, it did indeed exhibit characteristics which proved it was dated to the 1st century AD, the time of Christ. But the subject that now concerns us is the missing seal-stone from this tomb. Directly in front of the tomb is a groove for a rolling stone. The width of this groove is about two feet, the correct size for the stone Ron found buried in the earth. Another tomb from the 1st century (time of Christ) is that of Queen Helena of Adiabene. It is also located in the same general vicinity, further north, and the groove is exactly the same size as is featured in the Garden Tomb. Not only are the grooves for the seal stones identical in size, hers also contains an inclined section at one end at which the stone was rolled into the groove – exactly as does the Garden Tomb. Almost 2 Years of ExcavatingBy this time, Ron and the boys had been working here for almost two years. They had begun in January of 1979 and it was now late 1980. Of course, they weren’t working constantly – Ron was (as he is still today) an anesthetist with obligations to the hospitals he worked with. Due to the nature of his work, he was able to arrange to come over numerous times a year, but they could only stay for a few weeks at a time. And Ron was getting anxious. They had made some wonderful discoveries, and provided details to the authorities of their finds along with any artifacts they found. Some, they were allowed to keep because they were deemed of no significant worth. But they had explored the entire underground cliff-face, looking for an entrance into a cave or tunnel. If the Ark was in that location, it certainly would be hidden in a cave, he reasoned. Finally, as they continued to search, Ron made the comment to the boys that he was “impressed” that they should just break through the rock of the cliff-face. Ronny said he thought that was a good idea, but Ron resisted. That rock is extremely hard and he knew what difficult work it would be. Finally, when Danny told his father that he, too, believed they ought to do go ahead and break through the cliff face, Ron relented and agreed. It was the only option left. Inside the Cave SystemFor almost two years, they had been tunneling underground, finding artifacts and uncovering exciting structures almost daily. But now, they were in a barren cavern that they would soon learn was only a very small part of a very extensive honeycomb of natural caves and tunnels within the mountain. For almost a year, they explored this area, finding no evidence of any human presence. These natural tunnels were not all connected to each other, and they spent many hours chiseling through cave walls, searching for adjacent tunnels which they eventually found. But they found nothing else. As 1981 came to an end, Ron and the boys took their winter holidays to come to Jerusalem and work. Even though it is cold there in the winter, the cave system was always a very comfortable and constant temperature, both in summer as well as winter. But the work was beginning to take a toll on all three of them. They all began to develop a fever and slight chills. The dust they had inhaled over the years in those confined tunnels perhaps contributed to their pneumonia-like symptoms. Finally, on Christmas eve, Ron had to send Ronny back to the US because he was so ill. Danny had to follow on New Year’s eve. Ron, too was sick but this was a very special trip. The “Promise”As I explained in an earlier issue, Ron has never heard God speak audibly – he just prays about what he should do and then sometimes receives an “impression”. By now, he had been excavating for such a long time, he was beginning to wonder if he was wasting his time and had misinterpreted what he was supposed to do. He, as usual, prayed and asked to know what to do before he scheduled this December 1981 trip. This time, although he still heard no audible voice, in his mind came the promise that he would find the Ark of the Covenant on that trip. And he believed with all his heart that it was a true promise from the One Who could make such a promise and keep it. But things couldn’t have looked worse – Danny and Ronny were both very sick, and Ron was probably equally as sick but far more persistent (or stubborn) – he stayed to keep working. And alone without the boys, he needed some help. When excavating over the years, he had hired locals to help, mostly with the above ground work, such as hauling off debris. Each time they opened their excavation and worked, they had to completely restore the above ground area before they left- this was a condition of their being allowed to continue. And they had moved tons of earth and debris over the years which required local assistance in hauling it off above ground. He had met one young local whom he had discovered was very honest and trustworthy, and he began to use him in the actual excavation when Ronny and Danny weren’t available. Those of you who have read our account of the “Cave of Machpelah” excavation have already been introduced to this young Arab man, whom we called “James” to protect his and his family’s identity. His family owns the land which contains the burial cave in Hebron we believe to be the true Cave of Machpelah. In addition to earning Ron’s trust, “James” was small and slender – perfect for squeezing through the tight tunnels of the excavation. And it was “James” that Ron hired to assist him when Danny and Ronny left. Exploring Every “Nook and Cranny”Ron and the boys had explored most of the tunnels over the last year, but there were always more. Ron’s plan this trip was to leave no possibility unexplored. He and “James” crawled through the vast system of tunnels, now much larger and extensive because of the passages they had opened up and the walls they had chiseled through. Ron would decide where to go next and he and James would follow that tunnel. 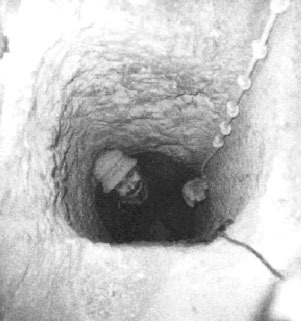 If and when they found a small opening, Ron would enlarge it enough for “James” to crawl through, and he would carefully check it out and report to Ron everything that he saw. They followed one particularly difficult passageway which took them through a “chimney” which extended straight up and a tight tunnel which was so small that Ron had to exhale in order to squiggle through. He had to stop to take a breath and when he inhaled, the tunnel was so tight be couldn’t fill his lungs completely. When they got through, Ron saw a very small opening in the wall of the tunnel they were now in. Directly in front of it was a stalactite about 16 inches long which almost appeared to be “guarding” the tiny hole. He knocked the stalactite off (and ended up bringing it home where we still have it today). Peering through the tiny hole, he could see nothing. So, he enlarged it enough to peer in. All he could see with the aid of his flashlight shining through the hole, was a chamber completely full of rocks (all larger than “fist” size) with about 18 inches of clearance between the rocks and the ceiling. It didn’t look promising at all, but he was leaving nothing unexplored. So he enlarged it enough for “James” to crawl through. “What”s in There? What’s in There?”Almost as soon as “James” crawled through the tiny opening, he frantically came tumbling back out, shaking and shouting “What’s in there? What’s in there? I’m not going back in there! !” Ron saw in his eyes sheer, complete and utter terror – yet, James said he had seen nothing! But whatever he experienced was real, for he left not only that chamber, but the entire cave system, never to return. It was “James'” reaction which sparked the hesitant excitement in Ron – he would have never given that chamber another look if not for “James'” terror. Now alone in this vast cave system, he took his hammer and chisel and enlarged the hole, crawling through. 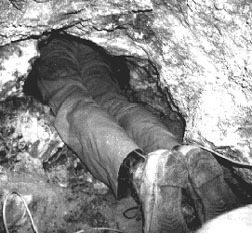 With only about 18 inches clearance, he had to lie on his stomach with nothing but his flashlight in his hand for light. Expectant after what happened to “James”, he looked at his watch – it was 2:00 pm, Wednesday, January 6, 1982. Shining his flashlight down through the massive pile of large rocks, his eye caught a glimpse of something shiny. He began slowly removing the rocks one at a time and discovered some dry-rotted wooden timbers just beneath the rocks, and then some also dry-rotted remains of animals skins that turned to powder when he moved them. The animals skins were covering a gold veneered table with a raised moulding around the side which consisted of an alternating pattern of a bell and a pomegranate. It only took him a moment to realize that at the least this WAS an object from the first temple! But he was in such a confined space, he couldn’t uncover the entire table. He later concluded, after closer examination, that this was the Table of Shewbread. The Discovery of the Earthquake Crack in the CeilingWith adrenaline flowing through his veins and great anticipation, he looked around to see what else he could see, which wasn’t much. He shined his flashlight around the open area and then up to the ceiling. There, he saw something that caught his eye – it was a crack in the ceiling with a black substance within the crack. Crawling slowly and painfully over the rocks to the rear of the chamber, he saw a stone case extending through the rocks. It had a flat stone top which was cracked completely in two and the smaller section was moved aside, creating an opening into the stone case. But the top was too near the ceiling for him to look inside. Yet he knew what was inside- the crack in the ceiling was directly above the cracked part of the lid, where it was open, and the black substance had fallen from the crack into the case because some of it had splashed onto the lid. It was at this time, as Ron recalls, as the instant realization of what had happened here dawned on him, that he passed out. When he realized that the crack in the ceiling was the end of the crack he had found in the elevated cross-hole many feet above him, and the black substance was blood which had fallen through the crack and into the stone case, he KNEW the Ark was in the stone case. But the most overwhelming realization was that Christ’s Blood had actually fallen onto the Mercy Seat. The condition of the chamber, completely full within 18 inches of the ceiling, made it impossible for Ron to do anything else. He could not foresee any possible way of bringing anything out unless the entrance to the chamber through which the objects were originally taken in was found. He climbed out the small hole, back through the tortuous series of tunnels and sealed the passageway with a stone. To anyone looking through the tunnel, it would appear that it came to an abrupt end. However, the rock could and would be easily removed by Ron when he returned. Ron didn’t report his experience to anyone at that time. He needed time to think and it would be a long time before his mind quit whirring with everything he had experienced. He had expected to find the Ark and bring it out, but that now seemed impossible. He made several more trips into the chamber, and eventually reported to the authorities as to what he had found. Perhaps not able to believe what he had told them he had found, or perhaps recognizing the problems that this could cause if made known, his superiors told him not to tell anyone about his discovery. However, it was too late for that because Ron had already told a few people and he confessed this fact to them. Realizing that “what is done is done”, they then ordered him not to reveal any MORE details than he already had revealed. Therefore, from this point on, we cannot be as specific as we have to this point. The time came when Ron provided something to the authorities from the excavation which DID convince them that he HAD at the least discovered SOME items from the first temple. Then a plan was devised by authorities to “test” the water so to speak- they wanted to carefully determine the public reaction should the announcement be made that the Ark of the Covenant HAD been discovered. The officials that Ron dealt with were serious government servants, concerned with the welfare of the people, and they realized that such an announcement would most likely set off a bloody clash between those who would want to immediately destroy the mosque on the temple mount to rebuild the temple, and the Arabs. While they did not necessarily have the religious belief that any temple would ever be rebuilt, they were well acquainted with the passion and fanaticism of those who did. Their efforts to test public reaction to the rebuilding of a new temple resulted in much bloodshed, and many deaths. Until this day, it is an extremely critical issue and the Israelis will, with great care, handle the situation the way they handle everything else – by a no-nonsense approach with the best interests of the people’s safety foremost. What that approach will be, we don’t know and perhaps even they won’t know until the time arrives. Verifying that the Ark was in the Stone CaseRon returned to the chamber on several occasions – one time he took a “Trinkle Drill” used by Orthopedic surgeons and a colonoscope used to look into the human body. He wanted to be sure the Ark was in that stone case. He tried to drill a small hole with the “Trinkle Drill” but it wouldn’t penetrate the stone. So he took his star-tipped stone chisel and hammer to accomplish the job. He would hammer the tip a little, then turn the bit, hammer then turn, over and over until he had an approximately 5/8″ hole into the stone case. The colonoscope is an optical device with a powerful light source which allows doctors to peer into the human body, and Ron had borrowed one from one of the doctors at the hospital he worked at. Inserting the colonoscope through the tiny hole, he guided it downward, rotating the lens until he saw what he recognized as the bottom of the crown-molding around the top of the Mercy Seat and then he saw the flat golden side. Since the colonoscope doesn’t allow viewing of a large area, and since he had little means to guide it other than a small latitude of rotation, he couldn’t see a great deal. But he saw enough to KNOW it was the Ark. Measuring the Depth of the Earthquake CrackOn one trip, he had one of his helpers sit by the elevated cross-hole with the earthquake crack while he ran a metal tape measure through the crack in the ceiling of the chamber. It extended through to the cross-hole and when his helper grabbed it to show that it had come through, Ron noted that the crack extended through twenty feet of solid rock. The Contents of the ChamberDuring his several visits to the chamber, he tried to thoroughly explore the contents. He measured the chamber and found it to be 22 feet long by 12 feet on 2 sides, while the other 2 sides followed the line of the cliff-face, forming a chamber that narrowed down in one corner. The objects he saw in that chamber that he feels confident in identifying are: the Ark of the Covenant in the Stone case; the Table of Shewbread; the Golden Altar of Incense that was in front of the veil; the Golden Censer; the seven-branched Candlestick holder, (which didn’t have candles but had tiny, bowl-like golden oil lamps which are built into the tips of the candlestick); a very large sword; an Ephod; a Miter with an ivory pomegranate on the tip; a brass shekel weight; numerous oil lamps; and a brass ring which appeared to be for hanging a curtain or something similar. There are more objects, but these are all Ron could positively identify. All of these objects were covered by the dry-rotted dark-colored animal skins, then dry-rotten wooden timbers on top of the skins, and finally the large rocks piled over everything. Ron has explained basically how the Ark looked, which we won’t repeat here since we covered that in newsletter #4, which is also contained in our “Discoveries Volume”. The Tables of Stone are still within the Ark, under the Mercy Seat. On the back of the Ark is a small open cubicle which still contains the “Book of the Law” and is presumably the one Moses, himself, wrote. To the best of his knowledge, the Book of Genesis is not there- only Exodus, Numbers, Leviticus, Deuteronomy. The thing that amazed Ron was that these Scrolls, written on animal skins, are in perfect condition today. Oil Lamps Inside the ChamberJust inside the chamber, by and near the original entrance which was now sealed up, he found a total of seven oil lamps that Ron believes had to have been left behind by those who brought the items into the chamber. The soot on the lamps and the rocks they sat upon clearly showed the direction of the breeze that followed them into the tunnel. One of the lamps is very ornate and displays Assyrian characteristics, which is consistent with the cultural influence of Judea at the time just prior to the Babylonian captivity. The picture of this particular oil lamp was not taken with a camera because the design on the lamp doesn’t show up well in a photo. This picture was made by placing the lamp on a copier and it revealed a little of the design, which we find very interesting. The center depicts a goat or a ram standing upon its hind legs, eating from a grape vine. This scene is very similar to the statue found in a grave in the Sumerian city of Ur, seen above right. The suggestion has been made that this may represent the ram caught in the thicket at the very moment that Abraham was about to sacrifice his son, Isaac, which served as the substitute sacrifice, sparing Isaac’s life – a “shadow” of the coming Messiah. This concept is further seen in the Hittite “tree of life”, as it has been interpreted, which can be seen in the frieze at right from Gordium which dates to the 6th century B.C., the same approximate time of the lamp Ron found. It is an interesting thought to consider the possibility of a relationship between the design on the lamp and the story of the “ram in the thicket” that was the substitute sacrifice- because the lamp was left in a chamber INSIDE Mt. Moriah where Abraham had brought Isaac to offer him as a sacrifice; and this same Mt. Moriah was where the Messiah died, the “substitute” sacrifice for fallen mankind. But this is just interesting conjecture on my part. Sealing the Passageway to the ChamberAfter his last visit to the chamber, a number of years ago, he permanently sealed the tunnel which led to the chamber. Ron has learned many lessons over the years, and some he had to learn the hard way. One lesson he learned this way was that he had to be very careful whom he shared his information with. During the course of their work there, they had numerous experiences with people which could have been disastrous without Divine Intervention. For example, one famous evangelist stumbled upon the hole into the excavation one day and Ron invited him to come down into the cave. Believing the man to be honest, Ron told him what they were searching for and big promises were made of assistance. 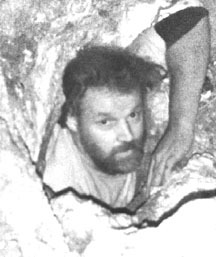 To make a long story short, a team of individuals from this evangelist’s group later returned to the site, telling the authorities they were with the Wyatt expedition and that Ron would arrive in a few days (which wasn’t true) and they went down into the cave system and began to dig. The cave walls where they were digging suddenly collapsed and they just narrowly avoided being buried alive in the debris. They immediately packed up and returned home. No real harm was done except that Ron and the boys had to re-excavate the entire area of the collapse. This and other similar incidents led Ron to seal the passage. With the honeycomb of tunnels, it would be almost impossible for anyone to find the correct passage, and this one now looked – even up close – as if it was a natural stone wall. Ron had done all that he could do using that passageway, anyhow. It would be impossible to get any large object out of the chamber through that original passage. All his attempts to photograph anything in the chamber resulted in photos or slides that looked like a complete blur, so he concluded that he simply wasn’t supposed to take any photographs. (He later understood why – at that time, he was much freer with sharing his information and this could have caused a lot of serious problems if some of the “unsavory characters” he came in contact with over the years had SEEN evidence that this solid gold object REALLY existed. Remember how Noah’s wife’s grave was plundered.) The next order of business would be to find the main entrance into the chamber – the passage through which the items were originally taken. The Original Passage Used to Carry the Ark into the CaveBefore permanently sealing the passageway, Ron had gone into the chamber with the Ark and opened the original entrance to see if he could follow it to its point of origin. When he opened it, he discovered on the other side a very large tunnel which extended in both directions. He observed that the tunnel appeared to be a natural tunnel that had been enlarged as he saw chisel marks. But the bad news was that it was completely blocked with large stones in both directions. The problem now to be solved was determining the path taken by those who put the items in the chamber. To resolve this question, Ron began by using simple reason. The items had been in the temple – that was their point of origin. They were now in this chamber, many feet below ground level. A great number of tunnels have been found under the temple mount and the city, but none that he knew of were heading in this direction. Was the entrance into the tunnel within the city or was it somewhere across the street in front of the northern wall? Ron had an idea as to where to begin his search. 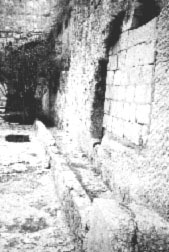 “Zedekiah’s Cave”In the winter of 1854, Dr. Barclay, a physician and missionary, went for a walk in Jerusalem. He was walking to the site of the traditional “Jeremiah’s Grotto” which is along the same Calvary escarpment. As he walked past the Damascus Gate, suddenly his dog, running ahead of him, vanished. As he searched for his dog who didn’t respond as he usually did to his owner’s whistles, he heard a muffled barking coming from the direction of the city wall. When he approached the wall, he noticed a deep hole and when he peered inside, he heard his dog’s familiar bark. 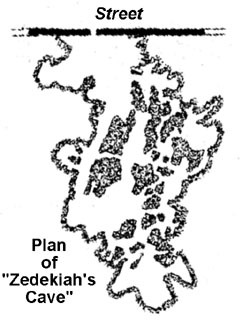 And this is how “Zedekiah’s Cave” was discovered (or rediscovered). This vast cavern is located underneath the Muslim section of the city, extending 750 feet into “Mt. Moriah”, beginning at the trench or dry moat separating the northern and southern portion. It is 325 feet wide at the maximum point and the average height is almost 50 feet. It was clearly a stone quarry, but at what point it was in use, we really do not know. There are those who believe its stone was used in the first temple, and that may be true. But its existence was not a well known fact and most likely it was always kept completely sealed for fear of any enemies trying to tunnel into the city. So little is known for sure about the giant quarry, but one point everyone agreed on was the fact that there was no entrance into the city from the quarry. Viewing the diagram of its layout, the dark areas are pillars of solid rock left in place to support the ceiling, like the pillars left in a coal mine. As the miners work their way back out of the mine after depleting it of all its coal, they remove these pillars of coal and the mine usually caves in. These were obviously left in place to prevent the cavern from collapsing since part of the northern city is above it. As Ron examined the quarry carefully, he noticed one thing that bothered him. When Ron tackles a project, the first thing he does is determine the easiest way to accomplish the task that requires the least work and as he walked the giant quarry, something didn’t make sense. He tried to put himself in the “shoes” of the ancient stonecutters as he surveyed this massive quarry. Seeing how deep into the side of the mountain the quarry extended, he thought about how much work it would have been to bring all that stone out of the quarry, carry it through one of the northern gates and into the city. It would have been easier to quarry it out of the quarry across the street than to haul it out of that cavern. To Ron, the solution was obvious – to cut a hole through the ceiling of the quarry and simply haul the rocks up into the city. The more he thought it about, the more obvious it became to him – yet, no one had ever found an entrance into the quarry from the city. So Ron began to examine the rock pillars. And sure enough, he found one that wasn’t a stone pillar at all. It was a giant mound of earth and debris, piled up, he believed, to the ceiling and through the hole in the ceiling. On the surface it would look like normal ground. 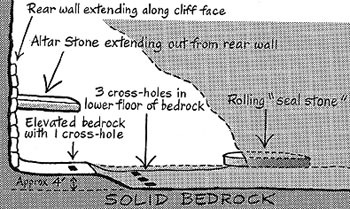 But unable to examine the section above ground, he didn’t know if the rock had been cut in a manner that would allow the cut-out section to fit back over the hole like a “man-hole cover” or if it was only the piled up earth that filled the hole. But he was convinced that the hole is there. More Work in the Cave SystemRon decided to continue to search for the original entrance into the chamber from within the cave system. With better hi-tech equipment, such as the radar, he was able to detect voids behind solid rock walls which was extremely useful. From one particular location within the cave system, he KNEW he was within a certain number of feet of the chamber- but getting from point A to point B through many, many feet of solid limestone just wasn’t that easy. He followed many false leads, such as a rock wall they found within the cave system which followed along the contour of the cliff-face, just as the wall of the chamber had done. But this lead didn’t pan out. I couldn’t understand the problem when Ron tried to explain everything to me – that is until I went into the cave system myself. As I entered the small hole, I expected to find myself in a large cave, like the ones I had been in as a child. Instead, I discovered the small hole went through a jagged shaft about twenty-five feet STRAIGHT DOWN – I had to hold onto a rope and sort of “rappel” off the rocks. Exiting the shaft, I found myself standing on some wooden planks which was the only “floor” and it was quite small – the open cavern continued on another forty or more feet beneath me. It was nothing like I had expected. By the time I had twisted and turned, trying to conform my body to the narrow shaft which led into this area, I discovered that I had absolutely NO idea of what direction I was facing. Without a compass, I was completely disoriented. Then, when I went through a couple of the small openings from the main chamber, I was absolutely amazed at how tight the areas were. Tending a bit toward claustrophobia, I had a brand new respect for Ron, Danny and Ronny – I couldn’t imagine how they did it, and I still can’t. I had earlier thought, “If you know how many feet it is to a certain point, why don’t you just measure it and go there?” But now, I understood why. In the tight confines, with cave walls and rocks everywhere, it seemed impossible to measure anything. Or even knowing the correct direction seemed impossible to me. Of course, Ron had worked in these caves and tunnels for so many years, he pretty much knew it like the back of his hand but this was not going to be easy. As I was writing this, Ron reminded me of an experience he had during this time. While clearing the tunnel with a group of good friends from Florida, he suddenly was struck with a feeling of impending “doom” or “disaster”. He told everyone about this “impression”, and explained that he didn’t know what was going to happen but that they all needed to quickly pack up the equipment and “get outta there”. All the guys did as he said, and just as they started walking out, everyone heard a loud booming thud coming from the area of the tunnel. A huge boulder in the ceiling of the tunnel had fallen right where Ron had been sitting. They returned the next day and Ron simply broke it up and removed it – the feeling of “doom” was gone and they continued working. But the debris plugging the hole appeared to have no end. They replaced the blocks exactly as they had found them and gave up, at least for the time being. For now, we have no idea if the tunnel is completely blocked the entire way, or even if it is the correct tunnel. However, the last time Ron went back into the tunnel, Ronny was able to take time off work and return with him – and Ronny found a Roman coin with Tiberius on it which indicates that the tunnel was opened in Roman times but then resealed. 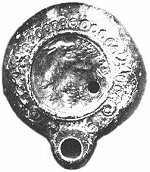 We could not find this particular coin in our list of Imperial Roman coins and therefore assume that the coin was a “city coin”. Digging Straight DownRon’s last resort was to attempt to dig a shaft through the solid rock into the chamber that held the Ark and other objects. But this was a very precarious approach – the shaft could cave in and damage some of the objects, or they could expend all that effort and discover they had missed the chamber. It would be a tremendous undertaking, requiring an awful lot of work. But one trip, after his main excavation team had left for home, Ron and a couple of faithful assistants began the shaft. They now had jackhammer-drills and much better equipment than he and the boys had used during the early years. They began drilling the shaft and got through about ten feet of solid limestone over several trips but the end didn’t seem anywhere in sight. And Ron experienced something that is common to the human species – he became frustrated at the tremendous effort and expense that appeared to be yielding absolutely no results. Of all the projects Ron has worked on and the discoveries he has made, his sense of unworthiness to work on this one was and is ever-present in his thoughts. The Biblical examples of those who did a work for God but at some time or another failed in some manner (such as the time Moses struck the rock when he was told to SPEAK to it, which cost him the privilege of being allowed to enter the promised land) are vivid reminders to Ron of how serious the consequences could be if he should allow any of his actions or motivations to go against God’s will. Sometimes, it was easy to discern his course of action, but other times it wasn’t. Plus, he reasoned that if the time came that he had failed and God could no longer use him, how would he know? And by this time, he was beginning to wonder if he was being “taken off the job”. He has always known that God didn’t NEED him to get His work done – He could always find someone else. His efforts didn’t seem to be paying off – it had now been almost ten years since he first found the Ark. The next trip, Ron and one assistant had gone to Jerusalem to work on the shaft. A month or two earlier Ron had spoken at a church and one man present took a particular interest in the Ark of the Covenant. I well remember when he called here and began to question me about when Ron was going over, etc. He sounded like a nice enough person and I told him I didn’t know for sure (which I didn’t) but that it would be in a few months. He then asked me where they stayed because, he explained, he was going to Israel and wanted a relatively cheap hotel. So, I told him where we usually stayed – it seemed like an innocent enough question. But I was soon to learn a terrible lesson – that we cannot tell anyone when he is going overseas to work, whether it be Israel or Egypt, or wherever. When Ron and our friend who was helping him arrived at the hotel, there was this man who had called me. He somehow had found out Ron’s arrival date (I hadn’t told him)! It turned out that this man was under the impression (or delusion) that he was some sort of “prophet” and intended to impose himself into the project. So here was Ron and his digger, ready to go to work – but there was no way Ron was going to let this man know anything important, so they went into the main cave system but couldn’t do the work they intended to do – not with him present. As Ron explained it to me, this episode was the straw that sort of “broke the camel’s back”. He had prayed, as he always does, about going over and had been convinced it was what he was supposed to do. At this time, Ron had to pay all the expenses out of his own pocket and this one was costly. Adding it all up, it was approximately $7,000.00 to $8,000.00 down the tubes, which is a LOT of money to us. So, Ron began to question if he was really doing what God wanted him to do, or if he was just fooling himself. At this time, it had been almost ten years since he had first found the Ark – had he done something wrong that God could no longer use him? Whatever was the case, Ron decided on that trip that he was through – finished. He would close up the cave system and never return. And let me tell you, this is NOT like Ron at all. He was very excited when he left here, and the experience with the “prophet” showing up must have been a terrible blow. What little he has told me about the incident indicates that it was a far worse experience than it sounds. But whatever happened, it completely deflated Ron, who interpreted the failed trip to mean that he had been “taken off the job”. But then Ron had an experience that changed his life. One day, he and the “prophet” were sitting on the ground just outside the entrance into the cave system- Ron’s helper was inside. Ron was working on the radar scanner – changing the paper or something – and the “prophet” was in the shade of a large bush eating his lunch. Where they were sitting was, at that time, many feet lower than the ground level just behind them because this was where Ron had excavated down years earlier. It’s necessary to understand this in light of the next event. Ron heard a voice behind him say “God bless you in what you are doing here”, and he looked up. Standing on the much higher ground many feet above him was a tall, slender man with dark hair wearing a long white robe and head covering similar to that worn in Biblical times – except that it was all pure white. Startled, mainly because he didn’t TELL anyone what he was “doing here”, he wondered who this man was. He tried to make polite conversation and asked him if he was from around the area. The man replied simply “No” then remained silent. Ron then asked him if he was a tourist, and he again replied simply, “No”. More silence, then the figure in white said, “I’m on my way from South Africa to the New Jerusalem”. Ron was so startled that he couldn’t say anything, but just stared at him. Then, the man again said, “God bless you in what you are doing here”, and then turned and walked away. I remember his call like it was yesterday. If you don’t know Ron personally, let me explain that Ron is very low-keyed. He never acts excited or angry – his voice rarely gives away his true feelings. But I knew something had happened even though his voice was calm. He told me what had happened, and explained how just hours earlier, he had silently given up – frustrated, tired and simply worn down, he had lost his belief that what he was doing was God’s will. Then, this stranger appeared and he repeated word for word their conversation. He was glad that the “prophet” had at least heard the conversation – at least he knew for sure that it really happened. And when he questioned the locals who worked along the only path anyone could take to enter the area, he discovered that NO one had seen anyone of that description either come into the area or leave. Although the escarpment is extremely long, today it is surrounded by buildings, fences and stone walls which prevent anyone coming into the area except through one particular street. And the vendors along that street have been there day after day as long as Ron had worked there and he knew them well. There was no doubt about it – the stranger in white had been seen by no one else. And then Ron told me that he believed it was more than just an angel – he was deeply impressed that it was Christ, Himself. Whether Christ, or an angel, the experience was enough to encourage Ron and convince him that his efforts had NOT been in vain, and that he WAS still in God’s will. And since then, I have seen the results of that experience over and over, in both of us. From that moment forward, nothing could or will ever dampened Ron’s zeal or belief in that or any other project. When he and his group were kidnaped about a year later in eastern Turkey, I know the knowledge of that experience gave me complete peace – I never once (after the initial shock) believed Ron was in serious danger because I knew he still had work to do. My calm was so noticeable that when Ron returned, his friends at the hospital ribbed him, saying “Your wife sure must not care too much for you because she was AWFULLY calm on TV when talking about her kidnaped husband.” Ron doesn’t talk about this experience with “the man in white” a great deal, but I believe it literally changed his life, giving him enough encouragement to endure whatever it takes to get the work finished. And since that time, Ron, like everyone else, has been waiting for the most part. No one was any more surprised when Ron first publicly told about the results of the blood tests on the specimens he had taken from the Mercy Seat than I was. (All that he has stated about this can be seen in his talk on our “Presentation” video and will not be repeated here.) As I have said, there is a great deal he hasn’t told even me, and this was one of those instances. He had taken other specimens from along the crack where it extends through the bedrock adjacent to the cross-hole and I myself had been able to take a small sample, rehydrate it over a three day period, and view the red blood cells through the microscope. But even then, he never mentioned to me any actual lab analyses being done. Nor have I ever seen the other specimen. Therefore, all I can report here is what he has already said, as he has told me that when the time is right, he plans to have two unbiased geneticists go into the chamber, take their own samples, and each do his own independent analysis which will be filmed in progress. Again, this is HIS plan – what HE hopes will occur – but as with everything else, we do not know for sure exactly how, when or where everything will ultimately occur. But for now, he has nothing more to say on the subject. He learned from his experiences with Noah’s Ark that even when he had the lab analyses filmed as they were done, there were those who came up with incredible reasons for discounting the results, such a saying that Ron “made” the specimen, etc. All one has to do is watch a bit of the O. J. Simpson trial to see how important blood tests can be. My personal opinion is this: IF the Lord intends that His Son’s Blood be shown publicly to have such unique characteristics that His humanity and divinity cannot be denied, He will arrange for this evidence to be presented in a manner that “clever” men cannot “explain it away” from honest people. Since the time Ron found the Blood, genetic (DNA) research has come a long way, perhaps indicating that God is preparing mankind for the proof that will not remain silent, but will shake the world. So, for now, just consider what little Ron has told, and again, watch and wait. Ron recalled to me the five people who had lost their lives at the very time they were attempting to interfere with or even halt the excavation. We will not make these public because of their families. But we still have the newspaper article – the front page of the Nashville Banner- telling about the death of one. This man had stumbled upon Ron and the boys as they were coming and going from the excavation and began to ask questions. He soon found out what was going on (at this time, Ron had already seen the Ark) and was determined that “the world” needed to know. He called a “press conference” in which he was going to announce “a great discovery”. When Ron learned of this, he and the boys immediately changed their flight and left the night before it was scheduled. It was to take place in a nearby alley-way that was relatively secluded. When Ron arrived back home, he found the account on the front page of the Nashville newspaper. The man had been found dead in that alley-way, shot in the head by a single “sniper’s” bullet when the journalists arrived. No further explanation was given. It is no “sin” to require evidence. “Faith” is not blind – it is based on reality which is all around us. But what was sufficient in the past is no longer sufficient to the “man” of today who is bombarded by so-called “scientific” evidences which the “experts” interpret to us as “positive evidence” that the Bible is a “myth”. God, in His mercy, is providing hard-core evidence for a generation that has been taught to believe as “gospel” the word of our educators and men of “higher learning”. No one should accept anyone’s word on anything until they can see evidence. However, when someone has backed up other claims with solid evidence, that is sufficient reason to consider something they may claim but be unable to prove at the time. Educate yourself on the subject and withhold final judgment until solid evidence is shown “yea” or “nay”. Everything is still where Ron found it, completely hidden and very well guarded. Will EVERYTHING be shown publicly? We don’t know – I know that Ron’s greatest desire is to excavate the entire area, exposing the site of the crucifixion down to the chamber, but whether that will ever happen, we just don’t know. I have learned that no matter how I believe events will occur, they ALWAYS happen differently. But surely the Ark will be brought out, won’t it? We don’t know if it ever will – it is deep in the earth and getting it and the other objects out at this time seems almost impossible without some Divine assistance. But we don’t know. Ron is of the belief that the things you have read about here will be made public within a year due to other events which we have cause to believe are about to occur (which we won’t mention now). However, if it doesn’t happen that soon, he certainly won’t give up – nor is he SAYING that it WILL be that soon – only that he believes there is a strong likelihood. We DO ask that you pray for this site because at this moment there are certain people, led by Satan, who are attempting to bury it even deeper in the earth than it already is. After all, what could Satan fear more than the evidence which lies buried there?! However things happen will be in God’s perfect time and no one will be able to change the events which He intends to occur. But perhaps we can hasten His coming by being faithful and diligent servants, finishing the work He has given us to do. We DO believe the world will get to SEE the Ark and other objects, and that the Tables of Stone WILL be brought out. And we DO believe the time is getting near. To understand why we believe this, keep reading. Prophecy is quickly fulfilling which is leading to the most monumental events of all history. But it appears that the majority of those who call themselves by His Name have been blinded to the great truths which will separate the sheep from the goats. If we go back to Genesis and the story of Cain and Abel, we learn from the beginning that God accepts NO substitute or variation in what He has commanded of us. Cain was enraged that his offering of produce from his fields was not acceptable- but God had specifically dictated the requirements of the sacrifices which were to be offered- blood sacrifices- because they were all representative of the death of His Son. In his rage, Cain slew his own brother, Abel, whose offering WAS accepted. As we continue through the Bible, we read over and over how His people never ceased from incorporating other practices in with the worship of God – practices which were NOT acceptable in any way, form or manner, EVEN though they may have appeared harmless to the people. God was and is always VERY precise and clear in His requirements of His people – they never changed over the years, even though many will very quickly tell you that they have. And today, the people who called themselves by His Name are about to face the greatest crisis they have ever had to face. This may seem hard to believe in this age when we no longer must worship in hiding and fear of persecution, but it is a fact. For it is now that the plan has been set into action for all churches to unite on common points of doctrine. All the suffering and persecution of God’s people who fought to maintain the purity of God’s doctrine through the ages is about to come to nought. Day after day the TV features various and sundry “leaders” speaking of how this “unity” will accomplish God’s work, when in fact, it will indeed finish a “work”, but it won’t be God’s. Pagan practices and doctrines that swiftly crept into the Christian faith soon after Christ’s time still dominate “Apostate Christianity” even though the purity of the faith was restored to some degree in many churches over the last few centuries. It was in this country, the United States of America, that the true purity of the faith was given the chance to grow and thrive. It was this country that would be uppermost in sending missionaries to the world to complete the spreading of the gospel. But now, just as the work is about to be finished, the churches that once fought so hard to remain free of the influence of “Apostate Christianity” are about to join with it. MAT 7:15 Beware of false prophets, which come to you in sheep’s clothing, but inwardly they are ravening wolves. 16 Ye shall know them by their fruits. Do men gather grapes of thorns, or figs of thistles?… 21 Not every one that saith unto me, Lord, Lord, shall enter into the kingdom of heaven; but he that doeth the will of my Father which is in heaven. 22 Many will say to me in that day, Lord, Lord, have we not prophesied in thy name? and in thy name have cast out devils? and in thy name done many wonderful works? 23 And then will I profess unto them, I never knew you: depart from me, ye that work iniquity. We should all be aware that God does NOT force Himself on any man. But Satan, on the other hand, will stop at nothing to accomplish his purposes. What will happen when all of “Christianity” is unified? Will the “good” rub off on the “bad”? OR are we in danger of being deceived by these “false” teachers, and what happens if we are? ISA 9:16 For THE LEADERS OF THIS PEOPLE CAUSE THEM TO ERR; and THEY THAT ARE LED OF THEM ARE DESTROYED. JER 5:30 A wonderful and horrible thing is committed in the land; 31 The prophets prophesy falsely, and the priests bear rule by their means; and my people love to have it so: and what will ye do in the end thereof? ACT 20:29 For I know this, that after my departing shall grievous wolves enter in among you, not sparing the flock. 30 Also of your own selves shall men arise, speaking perverse things, to draw away disciples after them. ROM 16:17 Now I beseech you, brethren, mark them which cause divisions and offences contrary to the doctrine which ye have learned; and AVOID THEM.18 For they that are such serve not our Lord Jesus Christ, but their own belly; and by good words and fair speeches deceive the hearts of the simple. ISA 8:20 To the law and to the testimony: if they speak NOT according to this word, it is because there is NO light in them. 2CO 11:14 And no marvel; for Satan himself is transformed into an angel of light.15 Therefore it is no great thing if his ministers also be transformed as the ministers of righteousness; whose end shall be according to their works. COL 2:4 And this I say, lest any man should beguile you with enticing words… 6 As ye have therefore received Christ Jesus the Lord, so walk ye in him:… 8 Beware lest any man spoil you through philosophy and vain deceit, after the tradition of men, after the rudiments of the world, and not after Christ. To follow any “man”- teacher, preacher, father, mother, etc.- is wrong. We follow only one, our Lord and Savior,Jesus Christ. We do NOT unite with those we know to have corrupt beliefs, even though we may share some common beliefs. PSA 4:3 But know that the LORD hath set apart him that is godly for himself: the LORD will hear when I call unto him. Before He died, Christ carefully explained the transition from the “old covenant” to the “new covenant”- any and all changes were explained and foretold by Him. He delivered the doctrine to man Himself, and then the time came when He ascended to Heaven, to the right side of His Father. From that moment on, there would be NO changes made in the faith that He had personally delivered. Yet, very, VERY soon there began to creep into the body of believers heresies and false teachings. The attempt to popularize Christianity led to the transference of pagan traditions to the practices of the church. This continued until the true faith was almost unrecognizable. Those of the true faith were once again forced to hide; they suffered the greatest persecution NOT at the hands of pagans but at the hands of those who had perverted the faith. Many are of the belief that since the gift of eternal life is free, that we have to do nothing to obtain it but ask. It would not be a “covenant” if this were the case- a “covenant” is an agreement between 2 parties with stipulations which both sides must meet. Eternal life is a free gift because we can do absolutely nothing to earn it. But we must cooperate with God in our own salvation, and this requires that we study His Word and KNOW what is His truth and what is the “doctrine of men”. We CANNOT compromise after the great sacrifice that has been made on our behalf. The plan has been set into action to undo the work of those who fought so fiercely for the preservation and restoration of the true faith. The plan is what some have referred to as a “one world religion”, but it is actually a plan for all the “churches” to unite under “common points of doctrine”, for the purpose of “spreading the Gospel of Jesus Christ”. But this “unity”, which WILL in some form come to pass, will ultimately NOT revolve around “common points of doctrine”, but instead it will involve COMPROMISE. To the masses of believers who have remained in ignorance of the true Biblical teachings and taught instead the theories of men, they will think this new found unity of the “church” is of God. 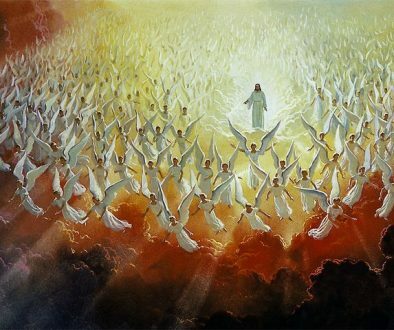 They will see it as the answer to the spiritual “death” that has come upon the world. But like a serpent slowly slithering in the grass, undetectable to the eye, the true character of this “unified church” will begin to unfold. The little compromises made by all of the churches in the beginning will soon be met with bigger and more radical ones. But the ball will already be rolling and none will be able to back out. Then suddenly, the “serpent” strikes- liberty of conscience will be no more. Religious laws will be issued which, although seemingly “good and moral”, will NOT be exactly as God Spoke them from Mt. Sinai, and then wrote with His Own Finger. Those who accept this “unified apostate church’s” version of God’s law and comply with it receive the “mark of the beast” “in their forehead”- which is symbolic of their rejection of God’s Law. Those who willingly comply with it although recognizing that it is opposed to God’s Law, receive this “mark” “in their hand”, which symbolizes their “knowing” disobedience to God’s Law in order to avoid persecution. But those who comply with God’s Law and reject this altered “version” do NOT receive this “mark”, which simply means they are considered by civil authorities to be lawbreakers. This has happened in the past to those who refused to compromise their faith and it WILL happen again. They cannot buy or sell. The reason they cannot buy or sell is because everything they own is confiscated. REV 18:2 …Babylon the great is fallen, is fallen, and is become the habitation of devils, and the hold of every foul spirit, and a cage of every unclean and hateful bird. 3 For all nations have drunk of the wine of the wrath of her fornication, and the kings of the earth have committed fornication with her, and the merchants of the earth are waxed rich through the abundance of her delicacies.4…. come out of her, my people, that ye be not partakers of her sins, and that ye receive not of her plagues. PSA 89:34 My covenant will I not break, NOR ALTER THE THING THAT IS GONE OUT OF MY LIPS. And just as Cain’s offering was rejected by God because it was not what He required, so too will those be rejected who choose to honor a law that is OPPOSED to what God requires. Then, the fury of Cain toward Abel when his sacrifice was rejected will again be manifest in the fury of those who reject God’s Laws toward those who accept it. Does this sound too incredible to be true? You don’t have to believe me- just watch and wait. JOHN 19:34 …one of the soldiers with a spear pierced his side, and forthwith came there out blood and water. DAN 9:24 Seventy weeks are determined upon thy people, and upon thy holy city, to… make reconciliation for iniquity, and to bring in everlasting RIGHTEOUSNESS,… and to ANOINT THE MOST HOLY. The prophecy of Isaiah 45:8, above, was then fulfilled- “salvation” and the way for all mankind to obtain the “righteousness” of Christ did “spring up together” after “the earth opened” and His offering of His Own Blood was accepted by His Father. In an instant, death was defeated by the greatest sacrifice in all eternity. Dare we ever- for even an instant- lose sight of what has been done for us? I pray not. HAB 3:4 And his brightness was as the light; he had BRIGHT BEAMS coming OUT OF HIS SIDE: and THERE was the HIDING OF HIS POWER….. (Marginal reading).